Roasted Garlic Pasta Salad is the perfect picnic or barbecue pasta dish! It's a fun new take on regular old pasta salad. The roasted garlic adds a sweet and garlicky flavor, while the tomatoes and spinach provide a nice, fresh pop of color and taste! You can easily cut the fat in this recipe by using a low fat sour cream and a reduced calorie mayonnaise, but regular are fine too! Make sure to use a firm garlic bulb. This will ensure the best flavor and texture! It's important to also use fresh spinach instead of frozen or cooked to provide the best taste and chew to the dish! Grape tomatoes work wonderfully, but so do cherry tomatoes. Diced large tomatoes can also be used, but tend to bleed the juices into the pasta salad a little too much. Roasted garlic will reach a nice sweet flavor when roasted on a lower temperature for a longer amount of time, think "low and slow". But if you are in a time crunch you can roast it at 400 F for 30 minutes and still reach a similar product! 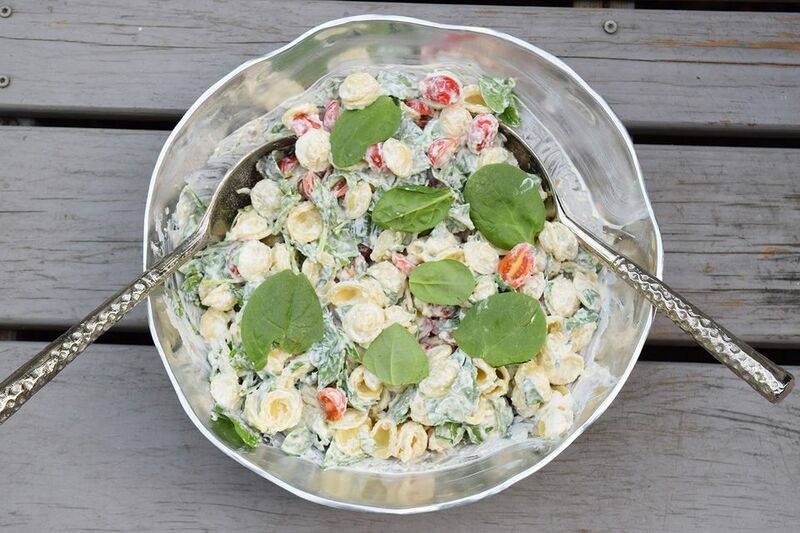 You can easily make the dressing ahead of time and assemble the pasta salad when you are ready to serve the dish to your party guests or family! Preheat your oven to 300 F. Wash the outside of the garlic bulb and dry thoroughly. Cut off the top of the garlic bulb, place the top and bottom on a piece of tin foil. Pour two tablespoons of olive oil over the garlic and sprinkle with salt. Close the tin foil completely around the garlic to create a little package. Place in the preheated oven and bake for about 2-3 hours. Check the softness of the cloves by poking them with a fork. It should be extremely soft, if not, place back in the oven! Boil the pasta according to package directions, rinse with cold water, and set aside to cool. Combine the roasted garlic cloves, mayonnaise, sour cream, parmesan, black pepper, and fresh garlic clove in a food processor. As it is blending, pour in the remaining olive oil. It should be rather thick. You can also add the olive oil from the roasted garlic packet, if there is any remaining. Place the pasta, spinach, and tomatoes in a large bowl. You can also place it in the pot that you cooked the pasta in, mix it in there and then place it in a serving bowl! Toss the pasta a veggies with the garlic dressing and toss to combine. Place in the refrigerator until you are ready to serve! Serve the pasta salad at room temperature or chilled!